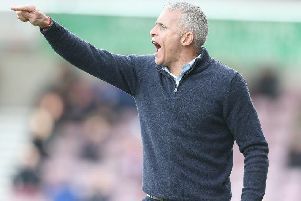 Keith Curle has revealed he won’t be setting any dates for contract talks with any of the Cobblers players while the season is ‘alive and kicking’. As it stands, several of the Town squad see their deals at the PTS Academy Stadium expire this summer, including the likes of David Buchanan, John-Joe O’Toole, Sam Foley, Dean Bowditch, Daniel Powell and Shay Facey. All will be keen to sort their futures, but Curle says it is highly likely contract talks are not something he is going to finalise until after the final ball of the Cobblers’ season has been kicked. He says he has already held some discussions with players, and that he has an ‘open door’ to talk to any player who has any concerns or questions. Curle has also promised to give those players that knock on his door ‘an honest answer’, but that doesn’t necessarily mean it will be the one they want to hear. “A few of the players I have seen already, and a few of the players have come to see me, asking what the situation is, and basically, I give them the honest answer,” said the Cobblers boss. “Every individual is different, and what you find is that some players need to know now, some players need to know later, and some players are making plans for themselves for next season anyway. “I don’t set a date (for sorting contracts), because the season is very much alive and kicking and there is an expectancy on every player for what I need them to do. “And that is whether they are going to be here next season, or whether they are going to further their career elsewhere. Curle accepts that players worrying about where their futures lie does create ‘uncertainty’, but says the best way anybody can try and earn themselves a new contract is by doing their job out on the pitch. “At every football club, at the end of the season, there is always that uncertainty, but the players in the changing room have harnessed things and have said ‘hey, we are playing for ourselves,” said the Town manager. “They have an understanding that no matter what happens, as a footballer you are virtually self-employed, because what you produce gives you the best opportunity of earning another contract, either where you are or somewhere else. Curle was of course somebody who enjoyed a long playing career himself, and although he was fortunate enough to never see any of his deals at any club run down, he does appreciate the difficult position that players, who have mortgages to pay and families to feed, find themselves in. “I never came to the end of my contract at a football club as a player,” said Curle, who played for the likes of Bristol Rovers, Bristol City, Wimbledon, Manchester City, Sheffield United and Wolves in a distinguished career. “I was always striving to improve, and I played in every division and worked my way up. “Through circumstances not only due to myself, my contracts always got taken over or bought out by somebody else. “But it does play a part, and I am aware the players have families, have responsibilities. So how will the contract talks pan out at the Cobblers come the end of the current campaign? “Some players here might get offered a contract that doesn’t suit them, and they are then well within their rights to choose a different option for themselves,” said Curle. “I don’t know exactly when the day will be, but at the end of the season I will have a meeting with every single player. “The day after the end of season do, I will sit down with all the players, starting at 8.30am, and I will work my way throughout the football club, meeting staff and players, and that is final conversation. “But between now and then there will be players that will come and see me and will give them the best information I can do. “For some of them the door is still ajar, for some of them the door is still open, and for some they will be told their future doesn’t lie here and that is the reality of it. “So there is no date set in stone (for talks), but I have an open door policy here and if a player has concern and it is affecting them, then they can come and see me.